photo sent to me by Jaime Dobbs. 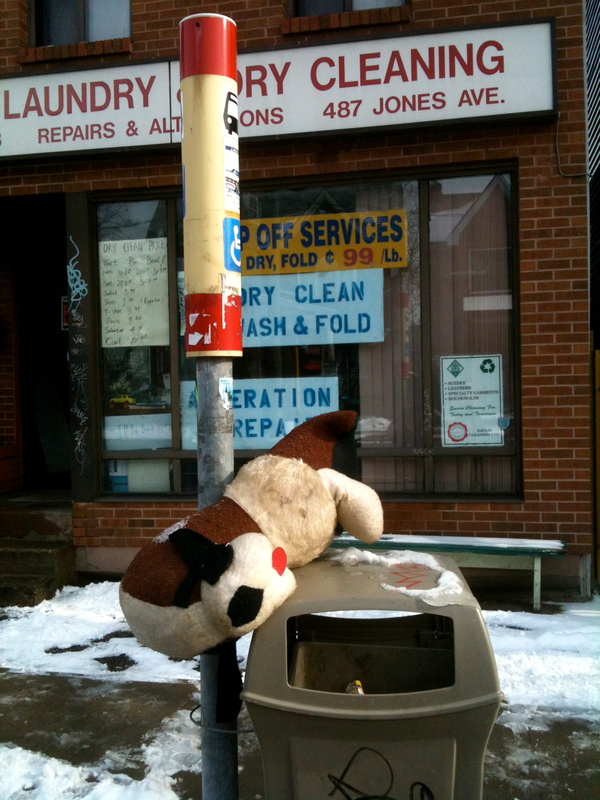 The stuffed dog rests on top of the garbage can. People waiting for the bus eye it curiously, but no one touches it. A man who is late for work misses the lip of the can, and his coffee sloshes over the dog's back, staining its fur. A crow pecks at the dog's hindquarters and carries away a hunk of stuffing in its beak. Someone deposits a wad of chewing gum onto the dog's ear. Then it is night, and Lucita Gonzales is waiting for the bus. Her calves are throbbing and her feet are hot and swollen inside her shoes. She is returning home from her job cleaning office buildings while the city sleeps. The bus is late. She shifts her weight from one foot to the other and takes a small foil wrapped candy from her purse. She unwraps the candy and pops it into her mouth. It tastes of coconut. Then she pulls out a stack of travel brochures and begins to leaf through them. Barbados. Puerta Vallarta. Fiji. Lucita dreams about vacations. She likes to imagine herself in a sun-drenched paradise. Sometimes when she's in an office building, staring out at the distant lights of the city, she pretends she is on a tropical island looking at the stars. Lucita notices a dark shape lying on top of the garbage can. She moves closer and can see it is a stuffed dog. The dog is ripped and covered in stains. She notices the hunk of chewing gum on its ear. And though she knows the dog is just made of fabric and thread, Lucita can't help help but wonder what it dreams of. Surely not this. Just before boarding the bus, Lucita picks up the dog and tucks it under her arm. Thank you. For Lucita and the dog. Britt, you are a wonderful writer.